Why do we use the term Celtic to refer music? There are no Celtic people left, only derivative cultures. Breton, Cornish and Welsh, Irish, Manx, Highland and possibly Galician. One of the common used terms that particularly irritates me is “celtic music”. When used, it most often refers to Scots/Irish and Canadian Cape Breton. This is not Celtic music, but the music of separate cultures that descended from the people others called Celts. •	Breton music (the biniou and bagad bands) is starting to be heard more widely on this side of the Atlantic. •	Welsh singing but is renown, but how many of us know the sound of their traditional instruments (crwth, pibgorn, tabor). •	Cornish music (Cornish double pipe, Crowdy Crawn) can be heard mostly in local festivals. •	Manx music (the lur and harp) are also are in revival, but their sounds are also rarely heard outside local festivals and fairs. •	Galicia & Asturias in northern Spain near (or even over) the Portugese border are often included in the list although there is some question over how much of the Celtic culture remains. 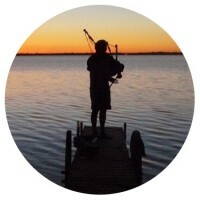 I play the Highland bagpipe and its music. The pipe music is varied (modern, dance music, marches through to piobaireachd). I do not play Celtic music. I recently heard someone who was talking about various music style and listed Scots-Irish, Celtic and Cape Breton. I doubt that by Celtic, she meant Cornish, Manx, Welsh or even Beton. So why Celtic music? Probably a mix of lack of knowledge and laziness. If it’s Irish music, it’s Irish music, etc. or the blend that is now called Scots-Irish. It’s not Celtic. We should be more specific. I sometimes get brainstorms and develop some pretty hair brained UWATs. Now that my children gave me my own website, I get to put some of them out there. During the last century’s two World Wars, Canadian soldiers were renown. They (along with some other Dominion forces) were the Commonwealth’s shock troops. Tim Cook in his two volume history of the First World War relates that the Germans called the Canadians Storm Troops. In the Second World War, the Canadians were given the tough task of liberating the lowlands – open, flat land that was well defended and where the defenders had a good view of anyone advancing. During the recent Afghanistan war, Canadians were tough, effective and respected. This is Fact. The Canadian Soldier is good. My UWAT is that our national sport(s) Hockey (and Lacrosse) set(s) us up to be the kind of people who can excel in the adversity and confusion that come with combat. I don’t mean the rockem sockem stuff, but the game as played by most of us at some time during our development. This UWAT is based more on the game of hockey than Lacrosse but knowing both games, the principles being discussed are the same. Hockey is said to have begun in the 1850s and formalized with rules in the 1880s. Our WW1 and 2 soldiers would have been familiar with the game and most likely played some form of hockey. (Lacrosse was played here in some form for more than 500 years. It too was formalized at about the time of Confederation. Many Canadians also played Lacrosse). Hockey is a free flowing game where all players must be adaptable and be able to cover for a team mate who gets caught out of position. The Captain of the team most often leads by example rather than giving orders and is not always on the playing surface. Although there are set plays, the game is so fluid that any set play is most likely a variation on the theme and adaptation and innovation is commonplace. On any team, the players are there because of skill level and love of the game. Social status/Class doesn’t matter as long as you can do your job and cover for the others as needed. Compare this to the games popular in the United States. 2. Baseball where the Manager (not a player) calls the game and all positions are very narrowly defined. And to the games of the UK. 2. Football (Soccer) which is the game for the commoner. 3. Cricket is a game with very narrowly defined roles. Is it not possible that when the lessons of a mechanized industrial war were being learned Canadians excelled because their national game(s) had established the psyche necessary for soldiers adapt as the battle plan disintegrated; assume more responsibility during interruptions in the chain of command due casualties and to adjust as situations required? If someone can develop an actual thesis of this UWAT, go ahead. If possible, I’d like some recognition as the original spark and maybe a copy of the paper.